Wells Fargo maintains a website with loads of content, user-friendly navigation and all the bells and whistles we've come to expect from big banks. 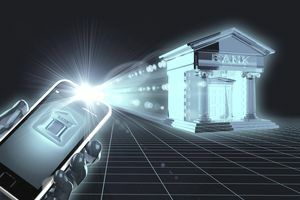 But aside from the standard offerings, Wells has made a few tweaks to the standard online banking offerings - and they've kept up with the times, providing mobile and P2P options that today's consumers demand. With the added features, the Wells Fargo digital banking experience has more pros than cons. Though Wells Fargo remains an old, established financial institution, it has embraced the twenty-first century by offering its clients first-class online products and the ability to do the majority of their banking and financial transactions via the web. Besides old-fashioned trips to the branch or calls to customer service, you've got several ways to manage accounts. Online: of course, there's a website you can access from any computer and browser. There you can do everything you'd expect to accomplish via online banking. This is also the best way to use Wells Fargo’s financial management tools (such as My Money Map, which helps you budget and track expenses). Mobile apps: if you bank on the go, Wells Fargo’s mobile app will let you do just about anything you’d imagine from your mobile device. This includes depositing checks by snapping a photo, which can save trips to the bank and extra waiting time for funds to get into your account. Looking for a free ATM nearby? Let your phone’s GPS system guide you there with the help of your app. Mobile site: mobile websites are somewhere between mobile apps and standard websites. If you visit WellsFargo.com you’ll end up on the mobile site, which is optimized for smaller screens. There’s less clutter taking up space, and it’s easier to click on what you need. Text banking: text messages might seem old-fashioned, but they’re still a handy tool for quick banking tasks. Suppose you just want to know your account balance. If you fire up an app or website, you’ll need to watch it load, enter a username and password on the tiny keyboard, and possibly navigate to a particular account. With text banking, you can shoot a quick text to the bank and get the information you need. When first landing on the Wells Fargo home page, a great deal of information and a variety of links appear in trademark orange and gold. The website is broken down into sections to make it easier to navigate. There are a variety of different links inside in each section. Despite a user-friendly layout, the overwhelming amount of information can be time-consuming to sift through. When clicking on the links, some of the web pages were slow to load, which may be an issue for some users. Some of the marketing can be overkill, but overall the site is very direct. Outlines of account offerings are concise and to the point. Wells Fargo allows consumers to set up and fund new checking accounts online, an added convenience (saving paper and trips to the branch). What’s not so convenient are the intermittent ads that appear before clicking to continue an application. Once you have an account, you can sign in and view your various accounts and investments at any time from the comfort of your own home. There is a complete section on how your personal information and privacy is protected, which is nice, and tabs that show historical statements and transactions. An added benefit of Wells Fargo’s online system is automatic bill pay, which makes paying those annoying monthly bills less of a hassle. If you need assistance, customer service options include telephone, e-mail support, mail service, and a large database of help topics. The Wells Fargo website is reasonably easy to navigate with plenty of information and a wealth of options. Some of the information is extraneous, but the site gets a thumbs up for ease of use and the amount of information it contains. If you already have a Wells Fargo account, utilizing the resources on this site would be a simple way to manage your accounts and pay your bills. What's more, all of your Wells Fargo products should be available under one login. If you have student loans, an auto loan, and checking accounts, you can see everything at-a-glance (in some cases it will take some legwork to ensure they're all linked under the same login). A nice feature offered by Wells is a custom tailored spending report along with a budget tracker. While many banks offer your basic transaction history, this turns the fine print transactions into visual data that’s much more helpful. Customers get an overall picture of where money is going each month, and how it compares to their proposed budget. Seeing all those Starbucks charges in graphical form makes them much harder to ignore than skimming through bank statements each month. This can be a great tool to help people get control of their spending and stay on budget. The tool only applies to accounts at Wells, but if you mainly pay bills from one checking account, it’s a valuable resource. Online systems are well and good...until there's a problem and you need to talk to a real person. Of course, like many big banks, getting to a live operator from Wells Fargo may take some effort and patience. A lot of patience. The customer service lines are open 24/7, however, which is more convenient for those who call outside of standard business hours. In fact, calling outside of those hours will probably end up with a much shorter wait in the queue. SurePay, Wells Fargo's P2P payment system, is not the strongest part of the online offering. The system is specific to Wells Fargo, so it requires that anybody you want to send or receive from is also a Wells Fargo customer (or they need to get an account with SurePay). The same is true for most other banks, so you can't hold it against Wells Fargo, but there are easier ways to send money. Note: this article was updated by Justin Pritchard. Is Walmart's Checking Account a Good Deal? Not Sure how to Write Out Numbers on a Check?